...217 Republicans voted to strip healthcare from more than 30 million people in order to obtain a trillion dollars in tax cuts for the top 2% of income earners. Our story begins with more than 50 votes over the last few years to repeal The Affordable Care Act, i.e. ObamaCare (ACA). And it continues through three attempts to pass their version of healthcare: The American Health Care Act (AHCA). See our recaps of prior versions here (March 8, 2017) and here (April 20, 2017). So what makes this version any different? 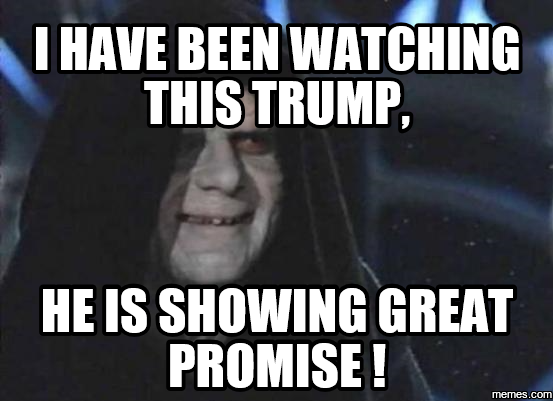 This time it has a double stamp of approval from Emperor Trumpalpatine. Emperor Palpatine wants us to trust him. He gives it two tiny thumbs up! I am watching the Democrats trying to defend the "you can keep you doctor, you can keep your plan & premiums will go down" ObamaCare lie." Insurance companies are fleeing ObamaCare - it is dead. 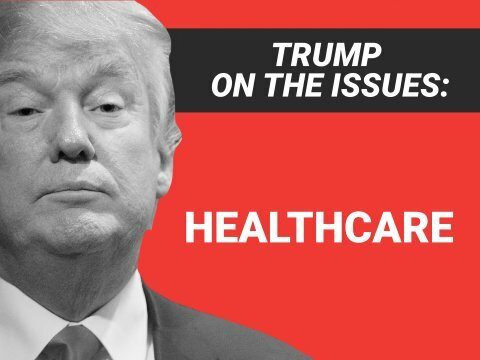 Our healthcare plan will lower premiums & deductibles - and be great healthcare! 80% of people who are on the Healthcare Exchange receive subsidies. Those are now gone. Instead it provides tax credits of up to $4,000, increasing with age and decreasing with income above $75,000 per individual or $150,000 per family. Those with the most to gain: married couples in their 60's nearing retirement and earning a six-figure salary. Almost all of the people in that category are white Republican voters. An additional $85 billion tax cut for for the elderly. Details are left to the Senate. Repeal of individual AND employer mandates. This takes the repeal one step further. Now companies will face no repercussions for stripping healthcare benefits from their employees. Instead of facing tax penalties for no coverage, the AHCA empowers insurance companies to charge a 30% markup for people whose coverage lapses. This makes insurance even less affordable for those that lose coverage. So if you lose coverage due to unaffordability, you will never receive healthcare again. States may request waivers of minimal healthcare coverages so they can offer sub-minimal insurance plans. Plans that will make the ObamaCare Bronze packages look like they're made of pure Palladium. Finally, they've authorized $123 billion for what they call a "stability fund" to smooth the transition over the next 8 years for high-risk individuals, those seeking preventative care, mental health benefits, and maternity care. Read that to mean none of those coverages will be available after 2026. Remove restrictions on statistical discrimination: meaning insurers can now start charging certain groups a disparate price. Shift burden of Medicaid funding to the states and end federal funding of Medicaid expansion. This alone will affect at least 14.4 million people. It also encourages states to promote a Work-for-Medicaid program similar to the 1990s Welfare Reforms. Guess What? It also cuts Medicaid for school children specifically in Special Ed programs. Restricts Upstate NY and Long Island counties from paying for state Medicaid bills for New York City residents. This was probably a late insertion to obtain 1-4 votes from NY Republican Congressmen. Restore support for federal payments to hospitals that treat the uninsured. This is a major payday for "not-for-profit" hospitals. Increases the cap on annual Health Savings Account (HSA) contributions -- something that are primarily utilized by wealthy white families as a tax shelter. Further proof this is only for the wealthy: It bans individuals from using money obtained through tax credits to be placed in HSAs. CNN reports that this was due to a fear of said money being used for abortions. Removes the cap on Flexible Spending Accounts (FSA). Coupled with the recent changes that allow FSA funds to be used beyond the year of accrual, this serves as yet another tax shelter for the wealthy. Eliminates the ObamaCare funding taxes that were placed on: the top 1% income earners (3.8% on investment income and 0.9% Medicare surcharge on individuals earning over $200,000); medical devices (2.3% excise tax); tanning services (10% sales tax); and repeals restrictions on tax breaks for insurance companies who pay out more than $500,000 in compensation to their executives. Now insurance companies can reduce their earnings by paying executives millions of dollars in benefits and options. This ultimately saves them billions of dollars in taxes annually. It reduces the threshold for deducting medical expenses to 5.8% of total income. Again helping the wealthy. It defunds the CDC Prevention and Public Health Fund. Finally, it defunds Planned Parenthood, instead providing $422 million to community health centers. Is all hope lost for The Resistance? Stay tuned for Episode 4: A New (Senate) Hope.